This is a regular blog post. If you’re looking for show notes or links to show audio, they’re here on the site, just in the other posts. I spent the day at the Vectren Dayton Airshow here in Dayton, Ohio, where, in addition to hitting the show, I’m visiting my college roommate, Jim Davis. This is my first year hitting Dayton. I can tell you already that I like the layout and the media situation and I’m looking forward to getting out on the grounds tomorrow to see the show in full swing. The Blue Angels are headlining and I got to see the team’s practice demo. It seems to be a little longer than I remember and it has several elements that are different from last year. 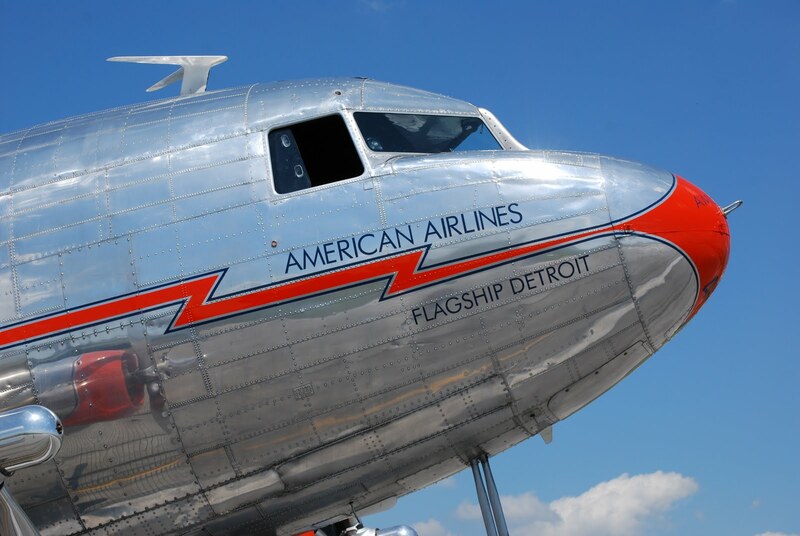 I spend the early afternoon getting a ride in Flagship Detroit, the oldest fully-restored DC-3 flying today (SN 45, delivered to American Airlines in 1937.). This ‘three is owned and operated by the Flagship Detroit Foundation. Lewis Drake and John Thatcher took Jim, me, and about a dozen other media reps out for about 0.6 to demonstrate the airplane. 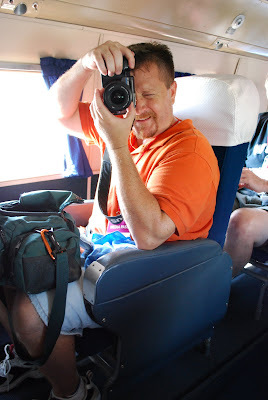 I flew a couple of video cameras, but the footage didn’t work very well. I mounted the Hero up on the top rear of the cockpit and a ContourHD on the flight engineer’s table. 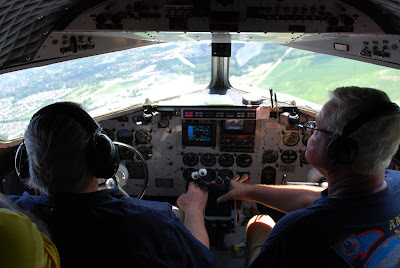 As I sat in the back looking up into the cockpit, I realized that that placement wasn’t working well, largely because the guy at the flight engineer’s seat kept lifting his still camera up directly in front of the Hero and shooting. And there was the parade of other media folks in front of the camera. No biggie, though. I got several sequences that I’ll likely be able to use in a later episode. And I plugged in the audio recorder and captured the intercom and ATC chatter. I haven’t had the opportunity yet to listen to the audio. But I explained to Lewis what the audio recorder was as I was de-installing it from the rear headset jack. And he said something to the effect of “Oh! Did you get the landing?” Which leads me to believe that there might be some fun stuff on the tape, both there and elsewhere. Lewis was enthusiastic and fun to be around. I can’t wait to audition that audio. I might do it on the drive home. I’m always conflicted about riding in a DC-3 or a C-47. Clearly, I love the airframe or I wouldn’t have gone all the way to Griffin and done a type rating training course in it. But I got the type rating to fly it, after all. I think I was a good passenger despite myself. As often as I make the joke about the pilots having the fish and being called upon to dash to the cockpit to land the airplane, this is one airliner that I know I can actually land. And that makes it weird somehow. Dan Gryder’s Herpa DC-3 was perfectly serviceable and hat its own gritty freight-dog appeal. I heard Dan say in an interview once on the 25 Zulu Show that N143D greasy and oily and he kept trying to talk people out of coming to train in it, but that they kept showing up to fly it. Yeah, I’m one of those guys. And I’m (and many others are) good with that. Flagship Detroit, on the other hand is pristine. The cockpit is clean and shiny. New(er) gages and dials and a clean panel. The Spirit harkens to a different line of history that the same airframe serves. This is the airplane that made air travel more common, even if not commonplace. It’s a different vibe. Neither better nor worse. Just different. And, for the record, I’d happily fly either of them tomorrow. Or right now, for that matter. Heck, I’m tailwheel current . 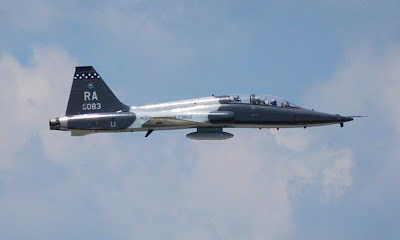 . .
Randolph AFB sent a couple of T-38Cs to the show and they were flying earlier in the day. There are a couple of Vipers on the ramp, too. I met the pilots. And, of course, there’s a T-6A. Airshows are becoming reunions of my dreams. Nodes of convergence by the gossamer functions that are these aircraft – these things that I first grew to love here on the tarmac and then pursued. Perhaps you’ve heard the line about the dog that chases cars and about what a dog like that would do if he actually caught one. In some sense, I’m that dog. And I’ve caught a few cars. Walking around the ramp on a day like today is an opportunity to reflect on how fortunate I’ve been to experience these aircraft, how hard I need to work to come up with a great episode for the T-38 ride to justify the trust that the Air Force placed in me, and the vast chasm between my abilities and the abilities of those pilots who regularly fly these aircraft. I mentioned at the beginning of this post that I’m visiting Jim (“Gumby”) Davis, who’s a senior desk editor at the Troy Daily News. Gumby and I roomed together for the last two and a half years that I went to Albion College. We were on 2nd East Seaton 1986-87 and then roommates in the Delt Sig house 1987-88. We spent many a sleepless night studying (or not) and once came within two hours of breaking the Delt Sig stay-awake record of 70 straight hours. Many an excellent memory is being re-lived and the deepest, darkest corners of my iPod are being plumbed for obscure stuff that I couldn’t fathom why was there until a few hours ago. We’re hitting the show again tomorrow to see what we can see. In the meantime, though, we’re heading out for some food and a beer or three.